You can certainly use the affirmation “I am a millionaire” while concentrating on feeling wealthy and grateful. 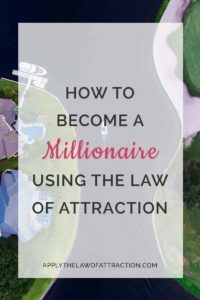 However, you will have more success using the Law of Attraction to become a millionaire if you are more specific, and you will also manifest the millionaire lifestyle you want. 1. Explore why you want to be a millionaire, how it will change your life, and how you will change. What will your life be like when you’re a millionaire? What kind of a house will you have? What kind of a car will you drive? Will you associate with different people? Do you mean that you have one million dollars or one hundred million dollars? After all, different amounts of money produce different lifestyles. You might want to do some research into the lifestyles of the wealthy to determine what you want. There are various magazines that cater specifically to the wealthy, as well as books and websites that can provide you with information. 3. Capture the feeling of being wealthy now. Imagine what it would be like to be as wealthy as you want to be. Hold onto that feeling and make it a part of who you are. If you will stand differently as a millionaire, begin standing that way now. Start changing your relationship with money to one where you love money. You are so happy and grateful for all the money that comes into your life, you can’t help but love it…and it loves you. Love all the things you do with money now – even if you’re paying your bills. For example, if you’re paying your electric bill, love all the things you were able to use electricity for that month. Feel gratitude for the lights it powered at night, for it making it possible for you to watch TV, etc. 4. Most importantly, ask yourself if it is a million dollars that you want or the lifestyle of a millionaire. With the Law of Attraction, it isn’t the how that matters. It’s the asking and the receiving. If what you want is the lifestyle, focus on the lifestyle. It could come to you without your ever needing anywhere close to a million dollars. If it truly is a specific dollar amount in your bank account that you desire, ask for it. When you focus on what you truly want versus what you think you have to have in order to get what you want, things begin to happen. So long as you think you have to have something before you can have your dreams, you’re making excuses that prevent you from attaining your dreams. Do you want to be a millionaire or do you want to live like a millionaire? If you want both, that’s okay too. The Law of Attraction will work for you. Are You Making This Mistake Using the Law of Attraction for Money? It's Time to Be Rich! I finally got it through remembering caus we know that this day is no different than its all the same so why not live in the fulfilled desire that it has already been done so of course i remember what it is lik to live with ten million. i know that all if welcometo me i just got to accept n know that any moment it shall take place in the natural and it will happen at the right time right moment right now. iknow that all my desires shall come to fruition bringing back all he memories associated with having the money in my bank account.